Custom built by and for the owners. This 1500 square foot, two bedroom, 1 bath house has much to offer the active beach lover in addition to the sun worshipping lounger. Ideally located one block up from 26th Ave beach and conveniently centered in Santa Cruz from Capitola to downtown Santa Cruz and the world famous Boardwalk. This sweet beach home beckons visitors to relax in a peaceful atmosphere. Fall asleep to the sounds of crashing waves and wake up to the scent of the ocean. Guests can walk or bike to many desired places around town and avoid the hassles of driving and parking. Guests love staying in our friendly neighborhood, walking, playing at the beach, watching surfers and abundant wildlife just off our shoreline. This house is a breath of fresh air with an open floor plan, hardwood floors, fireplace centerpiece, vaulted ceilings, skylights, spacious kitchen and living area. The gourmet kitchen is a food lovers delight, focused around a granite slab island for easy gathering and food prep. There is a double electric oven, 5 burner gas stove top, warming drawer, microwave oven, Grohe faucet and flat screen TV. The kitchen is stocked with basic cooking essentials such as oils, spices, sugars and baking goods and a Kitchen Aid mixer.There are fresh flowers throughout the house for each guest. *Provision services or catering can be provided by request. For example, local farmers market produce, fresh local fish, or meat from the famous Corralitos market. In addition to the comforts of this home, guests can enjoy the fireplace on cool Central Coast evenings as well as the deluxe Dimension One therapy hot tub and convenient outdoor shower after a surf session or beach run. The outdoor yards are wonderfully manicured and fully fenced. There is a Weber gas BBQ and fire pit in back yard. Washing machine and dryer in garage. Off street parking for several cars. For the working vacation, wireless high speed internet is available throughout the house. Active families will appreciate this house has available wetsuits, boogie boards, beach chairs, wagon, beach toys, jogger stroller, Pack and Play, high chair lots of childrens books and toys in garage as well as movies. Various size bicycles with helmets.We can also recommend wonderful babysitters.The Live Oak library is a short walk away and is surrounded by Corcoran Lagoon which is home to Great White Herons and many other types of animals and birds.The Simpkins swim center is also close by and offers many options for swimming and playing for children and adults.There is wood for bon fires,a small portable BB-Q and table provided for beach parties.There are so many great things to do in our neighborhood that it is possible to spend a week or longer and never have to drive anywhere. Andre has lived in Santa Cruz most of his life and I have lived here for thirty years. We enjoy living in this area because there is so much to offer. We go to the beach as often as possible with our two children.We also enjoy riding our bikes around town to the many wonderful places to see and enjoy. Water sports are definitely in the mix of our daily lives. Surfing, sailing, outrigger paddling and stand up paddling in Santa Cruz are popular things to do. We built the house for ourselves to live in and lived there for eight years until we grew out of it when our kids needed their own rooms.The house is perfectly set up for small families or a couple. We thought it would be a great vacation house and it has worked out nicely for our guests. Many of them return year after year and it is fun see their families grow. The house is located a block up from one of the best beaches in Santa Cruz.It has a deluxe Dimension One spa, outdoor shower, beautifully landscaped yard, privacy plantings surrounding the property, bikes and a baby jogger for guests to use and the inside is immaculately maintained. We live next to the house and do all the maintenance and cleaning. If anything needed we are close by to help out. The bathroom has a pocket door so there is privacy between the sink and vanity and the shower, toilet area. Lots of natural lighting with a big window and skylight. The house is located a block up from the beach. There is a staircase to the beach at the end of out street. Parking in driveway for four cars. Basic oils, spices, vinagers and baking items. there are many plates, bowls, assortment of glasses, utensils ect.. Granite slab counter tops. Island for prep and gathering. Small TV for watching and listening to music while cooking. dining table seats up to eight people. Owners available to help in any way with advice on activities, directions around town and nearby areas. We had a great stay, the house is perfect. We loved the garden for kids to play in and a 5 minute walk to beach. Perfect for families with young kids. Cathy was soooo awesome and helpful. We definitely will come back. Thank you for being great hosts. Great place. The owner was very kind and quick to be in touch about everything. Clean. Everything was nicely labeled, organized and in working order. I’d stay again no problem! Great home! Clean, beautiful, well equipped beyond expectation. Incredibly nice and helpful hosts. My girls and I had a wonderful time staying at this beach house. The owners, Cathy and Andre were very friendly and accommodating. 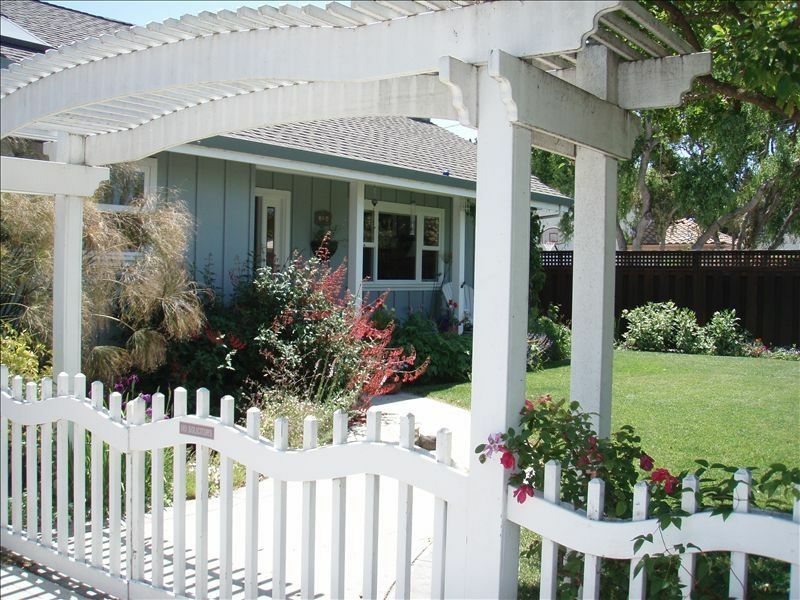 The house was the perfect walking distance to the beach with kids, and a short drive to Capitola and downtown Santa Cruz. We enjoyed the hot tub each night and sat by the fire pit and roasted marshmallows. We had such a nice time and we can't wait to book another visit! The place felt like a home. It was very clean and in a great neighborhood. The accommodations were good. The kitchen was fully equipped and the beds were comfortable. Cathy's house is lovely, with a large, well stocked kitchen. We enjoyed walking to the beach in the morning with our coffee and watching the surfers. A great place to stay in Santa Cruz and I hope to be back soon. There are so many sights to visit and activities to do in our area it is almost limitless. Depending on visitors interest. There are many State parks to hike and bike nearby. Also all water sports, golfing, biking ect..
Santa Cruz has great wineries and restaurants to explore. Our house is located a block from 26th Ave beach which has great waves for experienced surfers when the swell is moderately large. there are lots of Dolphin, Otters, Seals to watch from the shore on a regular basis. I love to travel and sometimes I don't have reception or wifi to respond within 24 hours, which is what vrbo requires when potential guests enter their CC information. It is best to send a direct inquiry to me before entering all the credit card information. That way guests CC are not held by the site. To bypass all the booking part just go to email owner and click on that tab and enter desired dates. Depending on the amount of time reserved the deposit for the stay could be more than $300. Five day minimum stay required during Summer months. If there are gaps in-between stays guests can have a shorter stay to fill them in. After Labor Day weekend the minimum stay is two nights. County of Santa Cruz TOT Certificate # CO00012. I love to travel and sometimes I don't have reception or WiFi to respond within 24 hours when guests inquire. It is best to send a direct inquiry to me before entering all the Credit Card information.